The free version is not extremely limited- feature comparison. For a .NET program Directory Monitor doesn't use as much RAM as I would have expected. But it starts a bit slowly. Last edited by smaragdus on Thu Aug 03, 2017 7:14 pm, edited 1 time in total. 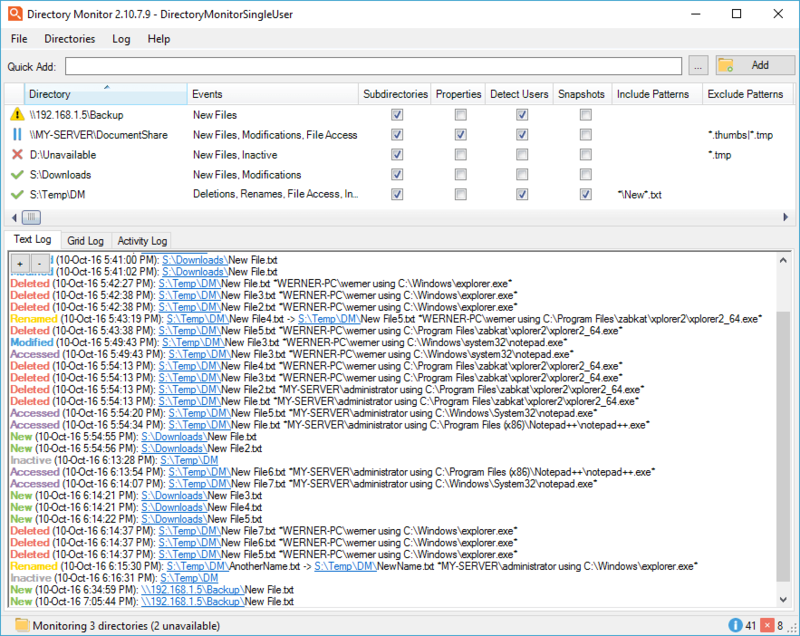 Topic update: DirectoryMonitor v2.11.0.0 released (changelog at https://directorymonitor.com/download/ChangeLog.txt). XP compatible, DotNET v4.0 required. A pro version has been made available with some nice extras that don't amount to an underpowered free nor overpowered pro version (see comparison). - Added default system language option because date and time formats were being defaulted to US when selecting English (Ticket #1434). - Pausing monitoring on a directory will now just pause the processing and queue up events instead of temporarily disabling it. - Include Oracle client libraries to avoid having to install large data provider just to connect to a remote Oracle database (Ticket #1336). - Ping "crl.microsoft.com" to ensure the service will startup correctly when Windows performs certificate revocation checks. - Improved user detection on directory creation. - Force starting the application in elevated mode when user detection is being used. - Fixed inactivity timer sometimes triggering on application upgrade (Ticket #1098). - Added %count% macro that can be used in certain places to determine how many events occurred before triggering script execution or emailing (Ticket #1426). - Added execute limit to the execution plugin (Ticket #1409). - Added ability to change user interface language from a menu option (automatic language detection disabled). Please vote if you agree.